Halite (/ˈhaləit/), commonly kent as rock saut, is the meeneral furm o sodium chloride (NaCl). Halite furms isometric crystals. 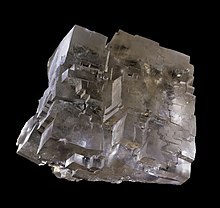 The mineral is teepically colourless or white, but mey be licht blae an aa, mirk blae, purpie, pink, reid, orange, yellae or gray dependin on the amoont an teep o impurities. It commonly occurs wi ither evaporite deposit meenerals lik several o the sulfates, halides, an borates. This page wis last eeditit on 26 Februar 2018, at 23:52.